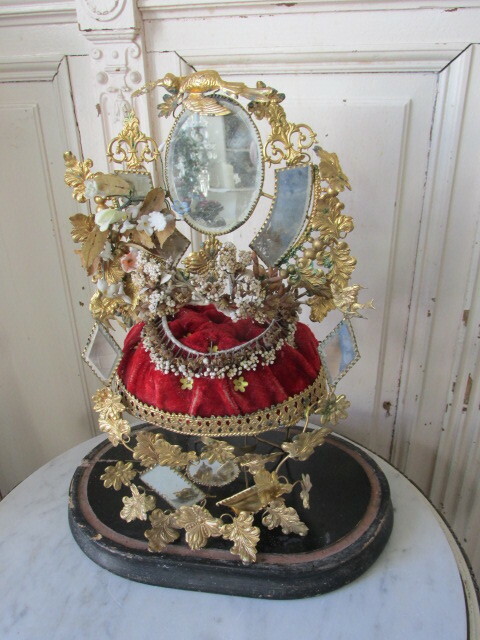 THIS IS A GORGEOUS OLD ANTIQUE FRENCH BRIDAL WEDDING DISPLAY STAND WITH A BRIDAL CROWN ON THE CUSHION. This is a French Antique Bridal Wedding Display Stand that dates from the turn of the century. They usually have a dome glass cover that sits on the bottom wood base, but this one is missing it. The wood base has a few little chips and a crack, but is solid. The display stand is attached to an oval wooden base. It is decorated with filigree and gilded metal tin ormolu, it has lots of embossed leaves, flowers and 3 ormolu bird carrying a Wedding Wreath. Please note that the bird at the top is missing one of his wings. In addition it has several small beveled mirrors, including an oval one in the top center. The mirrors have a nice aged patina with age spots . One of the mirrors is missing at the bottom right, as I show. The cushion is covered with deep cranberry velvet with little metal flowers pined in. There is a French wax bridal crown on the cushion, although you can no longer feel the wax. There also is another piece with tiny porcelain bisque flower that is added along the stand, which looks like you could remove to better see more of the metal tin detailing, if you wanted too. There is discoloration, fading, minor dirt, chippy paint and wear. There are probably a few missing metal leaves and flowers, some flowers from the crown. I am selling this as is, although it is still very beautiful. Measurements are about 17" tall by 13" wide and 8 1/2" deep. It weighs about 3 pounds.